2012 Funding -- $50,000 (click here and here). 2013-15 Funding -- Extension of time for use of unspent 2012 funding (click here). Description -- In order for the current flood protection status of South Aberdeen to be recognized Aberdeen needs to complete a certification process for its Southside Dike even though it was designed and built by the Army Corps of Engineers. This process is ongoing. There may be some dike improvements needed to meet the certification requirements. This project documents the effectiveness of the existing diking system. Present need is for geotechnical studies and design documentation. The City is not in a position to give a better estimate on the costs or timing of meeting certification requirements. Documentation has been provided to the Corp but it is possible that our documentation would not be sufficient and an outside consultant will need to be retained to perform some of the detailed analysis. Also the Corps may determine that some additional improvements are needed. This phase of project will be completed by July 2017. Flood Hazard Reduction Benefits -- Certifying the Southside Dike will ensure compliance with U.S. Army Corps of Engineers standards and the effectiveness of the Southside Dike to protect South Aberdeen from flooding events. The Southside Dike protects a residential population of approximately 4,000 people, an elementary school, a junior high school, major shopping centers, and various commercial businesses. Project Status -- On-Track, Underway. PENDING -- Submittal to FEMA for certification review. January 2017 -- Survey work to begin. DONE -- December 2016 -- Surveyor selected for recertification survey. DONE -- 11/2015 -- Funding approved for 2015-17 (click here). DONE -- End-September 2013 -- Schedule and Scope of Work to be set. DONE -- July 2013 -- Landau Associates selected. DONE -- 05/17/2013 -- FEMA determination (click here). DONE -- Levee recertification documentation sent to FEMA. DONE -- December 2012 -- Interagency funding agreement between Aberdeen and OFM approved. 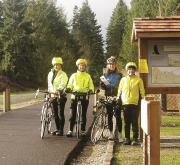 DONE -- 10/02/2012 -- Funding approved for Aberdeen by CRBFA and Chehalis Tribe (click here).